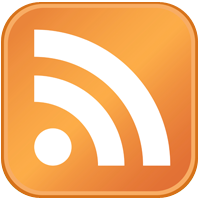 If you’re learning about ACIO for the first time, please click here for more information and background. This project has been designed by ACIO members and here’s how it works – 1) 127 members have divided into 25 groups of approximately 5 members each. 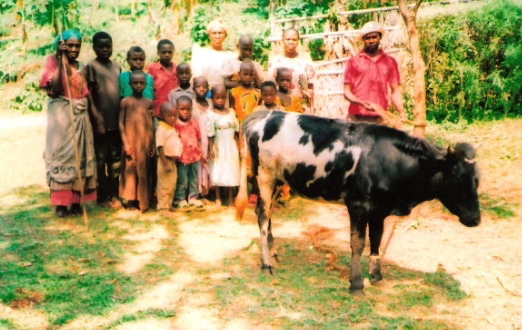 As we are able to accumulate the funds and as the caregivers are prepared to receive one, we will help each group purchase one heifer. 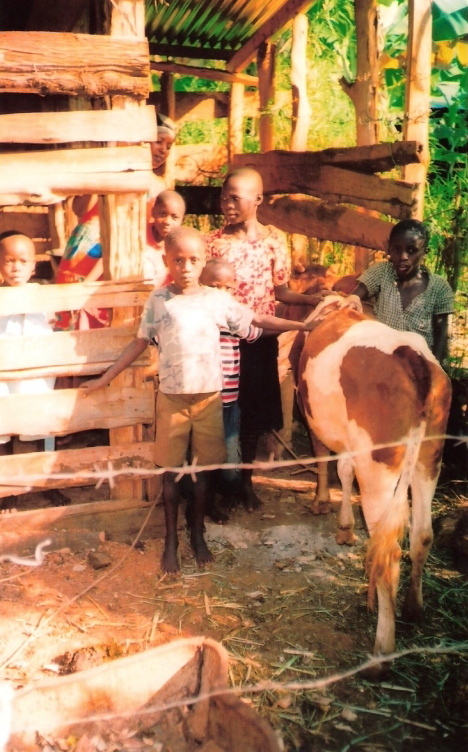 2) Each group is currently raising a contribution of 25% to invest as stakeholders towards the purchase of their heifer, and are asking for our help with the balance. 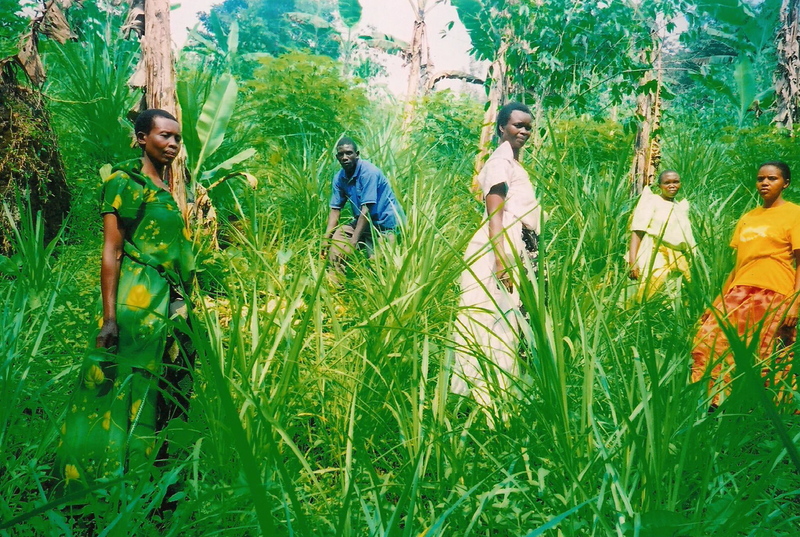 3) Each group is currently building a “zero-grazing” pen for the heifer in accordance with Ugandan Government recommendations. 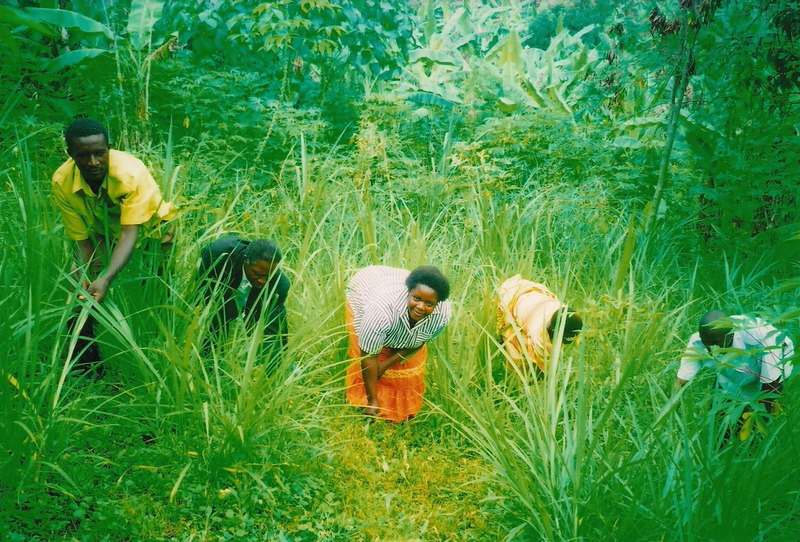 4) Each group is currently planting, harvesting and storing a special type of grass most recommended for the production of delicious, nutritious milk. 5) When each group receives their heifer it will be bred and offspring shall be passed to the next member in the group and so on and so on, until all members in each group have one heifer. 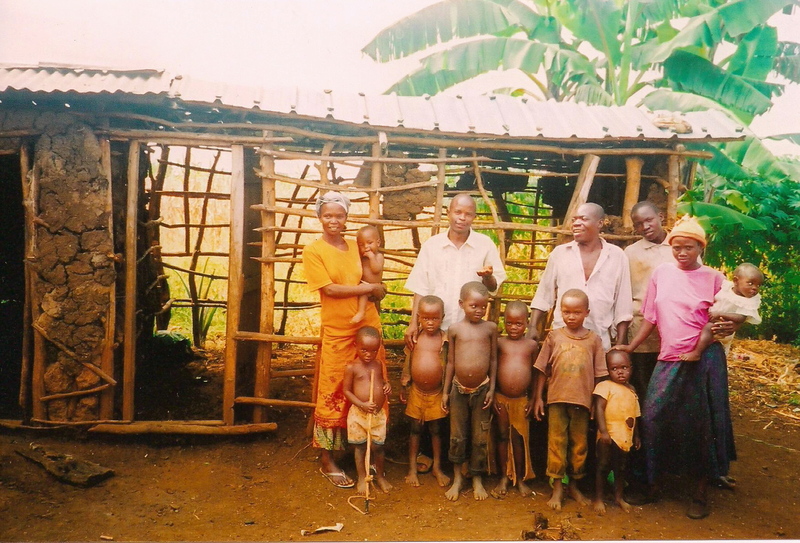 6) As milk production exceeds daily needs for the members and the orphaned children living with them, the members plan to form a co-operative in the trading center where they will sell the milk, sharing profits. Some info About Heifers and Milk – Vincent, the Director of ACIO informs me …We shall choose 2 year old cross breed heifers.. 1) A heifer is a young female cow that has not yet had a calf. 2) A cross breed heifer is one that has a mixture of exotic breed and local indigenous breed. 3) A cross breed heifer is easy to manage because they are resistant to tropical diseases. 4) A cross breed heifer can be bred when it matures at 2 years, and will begin producing milk when it calves. After calfing the heifer will produce milk for about 6 months and if well fed can conceive again after 3 months of calfing. 5) A cross breed heifer can live for more than 5 years. When one heifer is well cared for, it produces 15 litres of milk per day, 450 litres in one month. One litre of milk ( just over 32 ounces ) has an approximate value of 1000 Ugandan shillings, or .50 cents Canadian. Our goal is 25 Heifers.. And we’re asking for your help to achieve it! Whatever amount you contribute we will add it to the member’s stakeholder amounts and in this manner, one heifer at a time, one group of members at a time, we shall eventually purchase the 25 heifers with the 127 members! Your financial support is very appreciated! 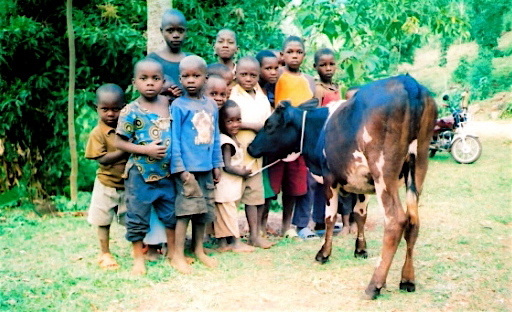 It will help purchase heifers that in turn will provide milk daily for orphaned children and their caregivers, and generate much needed income potential and possibilities! On my “handy-dandy cow chart” above you can see how much your one-time contribution will equal in terms of 8oz glasses of milk produced, every day, for the life of the heifer… which if all goes well, will be over 5 years! Gift Cards are available if you would like to contribute towards a heifer in the name of friends, family members, etc.. 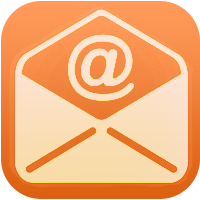 Please request your card/s by adding a note when you make your contribution through paypal (+/or I will confirm by email 🙂 and provide your complete mailing address! I’ll get your card/s in the mail to you right away! Thank You! 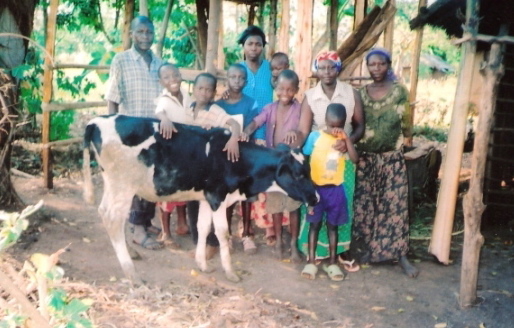 “Heifer Milk Cow Project” Update – January 2011 ~ Very exciting news, phase 1 of the “ACIO Heifers Milk Cow for Caregivers” project has been launched! 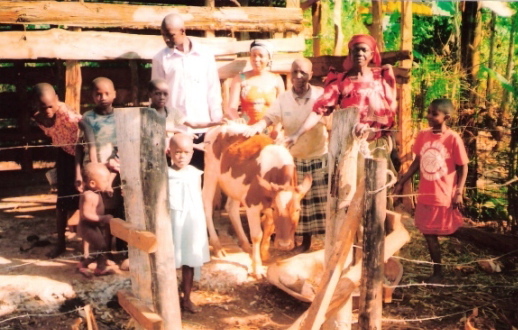 Vincent, the Director of ACIO, along with the ACIO Heifer Committee has purchased and distributed the first 12 heifers to 60 caregivers who are ready to receive a heifer. 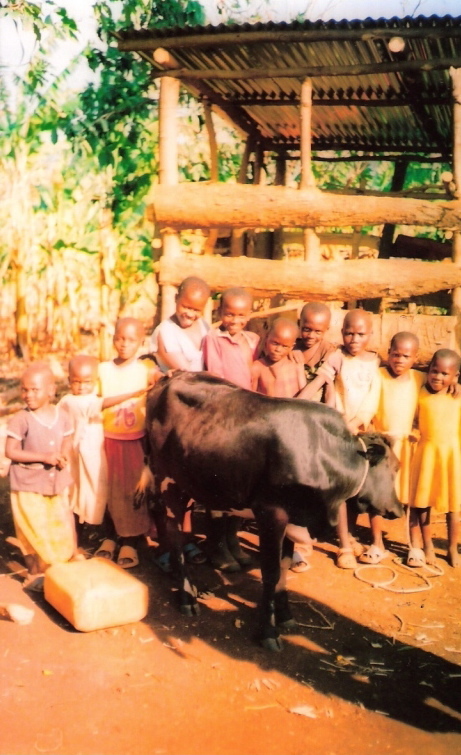 These groups have each built a heifer pen, are growing/harvesting/storing grass for feed for their heifer, and have saved 25% the value of their heifer as a stakeholder contribution, and now LITA, through the generosity of family, friends and donors – 9 of the first 12 heifers were sponsored by the fundraising efforts of the children at the Vancouver elementary school mentioned above – has helped with the 75% balance required for each heifer. Very inspiring and empowering for the community, Vincent relays that the members and children alike overjoyed and filled with hope these days, and are happily working together to bring all aspects of the project to fruition! Now that the first 12 heifers are in place, bringing empowerment to 60 caregivers and close to 200 orphans in their care, we shall move on to the next 3 groups who are ready.. bringing the total to 15 heifers! And on and on we’ll go, as caregivers become ready and funds on hand allow. Once we have helped this to happen for all caregivers wishing to participate to date, 127 at present, all in all over 400 children will be benefitting from this project! Wonderful! Enjoy ~ Blessings and Love, and so much gratitude to all those who have made possible these incredible and empowering changes in the lives of the caregivers and children alike. 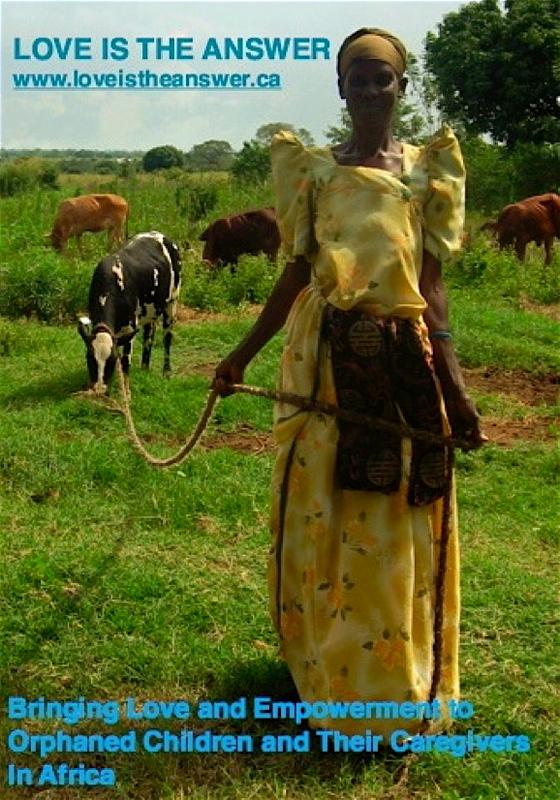 March 2011 Update – So far, we have helped the first 15 groups of (approx 75 ) caregivers to purchase heifers! It’s been reported to us that 1 heifer has died of “heifer flu”, 1 is expecting to calf by next May, and the remaining 13 are doing well, rapidly approaching breeding age. 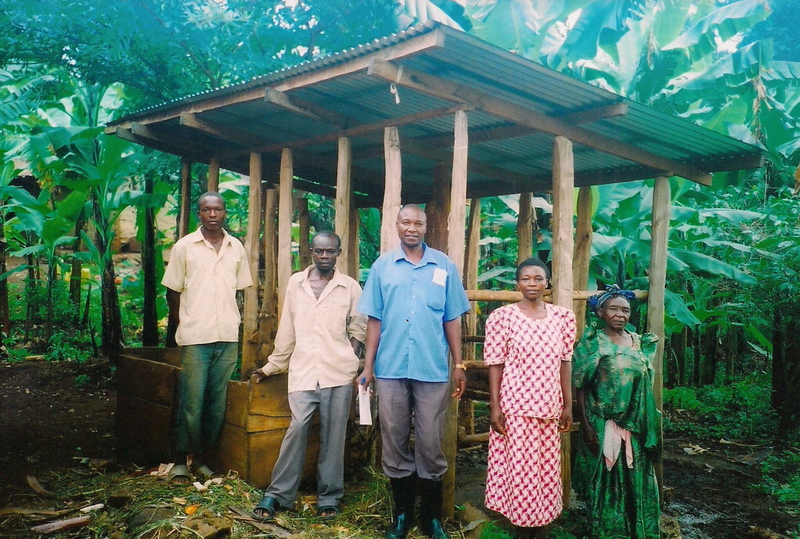 The remaining groups of caregivers are still preparing to participate in the project.. they are busy growing the feed, building their heifer pen and saving their 25% stakeholder portion of the cost of the heifer. Wonderful! 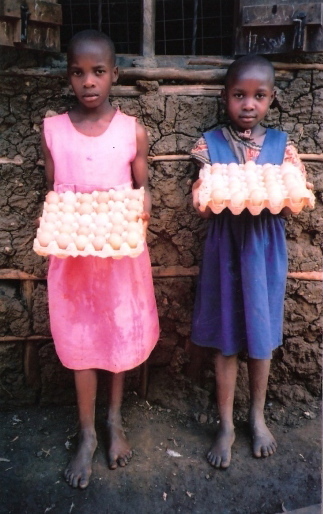 POULTRY PROJCT UPDATE – As of January 2011, the project looks to be right on target towards self-sustainability by month end, 6 months since the launch, generating eggs to feed the children in full time care at the “center”, eggs to sell to raise income for the feed the hens require… and profit for savings! From here on in the project will continue to grow as new chicks are introduced and so on and so on. 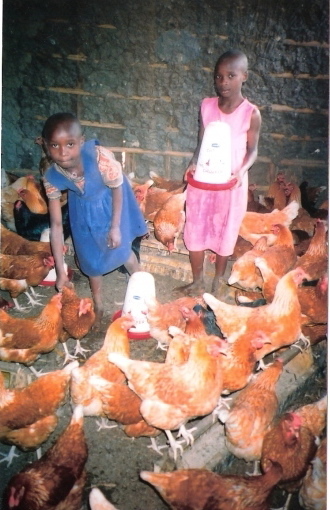 Once we commence building on the site for the new child care center, the hen house located at the former center that was flooded no sooner than it was built in 2010 will be moved and the entire poultry project will be relocated there!